JEE Main 2019: JEE Main 2019 Answer Key has been released now, Check Answer Key link below. JEE Main 2019 Admit Card for April Session has been released now, Candidates can download the JEE Main 2019 Admit Card from the official website of NTA. Due to the Lok Sabha Election the authority has been changed the JEE Main 2019 Exam Dates. JEE Main 2019 Application Form Correction for April Session is starting from 11th March 2019 to 15th March 2019. The JEE Main 2019 Examination for April Session will be held from 8th April 2019 to 12th April 2019. The Examination will be held in two shifts, the timing of the first shift of JEE Main 2019 April Session examination is 9:30 A.M to 12:30 P.M and the timing of Shift 2 is from 2:30 P.M to 5:30 P.M. NTA(National Testing Agency) which is conducting authority for this year. Joint Entrance examination (JEE) Main is the National Level Engineering entrance exam. It will be conducted by NTA from 2019 session for admission into the B.E./B.Tech and B.Arch./B.Plan. courses which are offered by the IIITs (Indian Institute of Information Technology), IITs (Indian Institute of Technology), NITs (National Institute of Technology) and CFTs (Centrally Funded Institutions). JEE Main is also the gateway to appear in JEE Advanced 2019. JEE Main 2019 Answer Key released, Check Here. JEE Main 2019 Admit Card for April Session has been released now, Download JEE Main Admit Card. JEE Main 2019 Exam Dates has been Changed, now exam will be held from 8th to 12th April 2019. Check JEE Main 2019 Complete Schedule. JEE Main 2019 Application Correction has been stating from 11th March 2019, Check Here JEE Main Application Correction for April Session. CBSE has revised Class 12th Board Exam Dates, Click Here to Check. 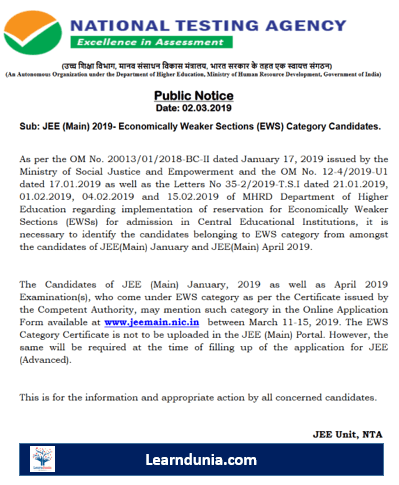 JEE (Main) 2019 Economically Weaker Sections (EWS) Category candidates has been released. Candidates are required mention such category in the Online Application Form from 11th to 15th March 2019. CBSE has been released the Exam Dates for CLASS 12th and for CLASS 10th. NTA will release JEE Main 2019 Admit Card on 7th April 2019. NTA will release the JEE Main Application Correction from 11th March 2019 to 15th March 2019. Candidates can Edit/Modify Application Details except JEE Main Exam Centers. JEE Main Exam Practice Center will be released soon, Click Here to Check. JEE Main 2019 Answer Key by various coaching institutes has been released, Click Here to Check. Motive Provide Admission to the students IITs, NITs, and GFTIs. No need to verify class 12th Certificate. Approx. Top 2,25,000 JEE Main qualified candidates are eligible to appear for JEE Advance exam. For the Online exam of JEE Main or JEE Advance, Candidates can book their slot. Diabetes student can take sugar tables, fruits and a transparent bottle of water at the exam center. Those who have successfully registered for JEE Main Examination will only able to download JEE Main Admit Card. The authority will also provide the JEE Main Slot Booking Facility to the candidates from the last year. The Admit Card will be released only in Online Mode. The admit card available from 18th March 2019 (for April session). The board will also provide the facility to book the slot for the online mode examination. Candidates will only able to download the admit card/hall ticket by entering their application number, date of birth or security code. If after generating the hall ticket for JEE Main examination candidates find any discrepancy candidates need to contact with the conducting authority. Admit card will contain the exam schedule, exam centers details, candidate’s roll number, etc. Candidates need to carry this hall ticket along with One ID Proof. Candidates can edit/correct their application form 11th March 2019 to 15th March 2019. Application form correction facility was available only via Online mode. JEE Main Correction window will also open for correction in application form details like the change in exam mode from PBT to CBT, the city of examination, change in paper-2 to paper-1. For making the correction in the application form an additional fee can be paid through credit/debit card, e-wallet or e-challan. The exam conducting authority (NTA) clears that, candidates can edit the JEE Main 2019 Application information except for the JEE Main Exam Center. 10% EWS (Economically Weaker Section). The passport size picture should be formal or school dress. If in case the picture clicked in the informal dress like (wearing hats, caps and dark glasses) will lead your uploading photographs towards cancelation. The passport size photographs must be clear. Picture file size must be under 1 Kb to 40 Kb. If any candidates will not upload the same in the given guidelines then it will lead the application process towards the cancelation, or you need to again correct the details in the correction period. Picture dimension format must be 3.5 cm(height)* 4.5 cm(width). As per the information bulletin, only JPG and JPEG Format are accepted. Notification of JEE Main 2019 April Session has been released. The application form has been released on 8th February 2019. JEE Main 2019 Application Correction will be Started from 11th March 2019 to 15th March 2019. The application form will be available via only online mode. For filling JEE Main Application Form candidates need to upload scanned images in the form i.e. Passport size photographs, Signature of candidates & mothers/fathers & parents. The size of passport size photographs should be 3.5*4.5 cm. The size for a signature should be 3.5*1.5 cm. Candidates signature and passport size should be in Jpeg or JPG formats. Submission of multiple application will lead your application towards the cancellation. There is no need of sending JEE Main Application Form’s hard copy to the conducting authority centers. Payment can be done credit card/debit card or e-challan. GST will also be applicable. Those who are opting e-challan can make the payment in Syndicate/ICICI/Canara Bank in cash. Application Fee is different for the different category and mode of the examination. Relaxation: 5 years relaxation shall be provided in the upper age limit of SC/ST & PWD candidates (i.e. DOB falls on or after 1st October 1989). Qualifying Exam: It is must for the candidates to pass the 12th examination/qualifying examination with 5 subjects to be eligible for JEE Main 2019. Subjects: The qualifying examination must be passed/appearing with five subjects. Candidates must have physics & mathematics as compulsory subjects. No Minimum Marks: There are no minimum marks required in the 12th examination for writing the JEE Main exam. However, candidates have to secure the passing marks. Passing Year: Those who have appeared and passed the higher secondary examination in 2016 are not eligible to appear in JEE Main 2019 but those who appeared in 2016 but did not pass and passed in 2017 are also eligible to apply. Moreover, candidates appearing in the final examination of 12th in 2018 can also fill the JEE Main application form. In case if the candidate appeared the 12th examination in 2015 but not passed in 2015, passed in 2016 are also not eligible. Candidates must have physics, mathematics is the compulsory subjects in the qualifying examination or anyone from the Chemistry, Biology, Biotechnology, Technical Vocational Subject, and any other subject. Total 3 attempts will be given for clearing the JEE Main. Attempts will be counted from the year 2017 onwards. JEE Advanced can be attempted a maximum 2 times in consecutive years. Attempt limit is the same for all the categories. Percentage Marks: To be eligible for admission in IITs, NITs, CFTIs, candidates should have obtained 75% marks in the 12th examination or must be in the top 20 percentile in the 12th examination of respective boards. The qualifying marks for SC/ST will be 65%. JEE Main Previous Years Cutoff. Candidates who are applying for JEE Main Paper 2 (B.Arch/B.Planning) must have Physics, Chemistry & Mathematics are the mandatory subjects in qualifying examination. It is not necessary to verify their class 12th roll number. Students will able to book their exam slots. Top 2,24,000 students will be qualifying for JEE Advanced Examination. As previous conducting authority, CBSE (Central Board of Secondary Education) increased the number of examination centers i.e. 258 exam centers which include 248 in India and rest of belongs from the abroad cities. Diabetic students can able to take sugar tables, fruits and a transparent bottle of water at the exam center along with him. From August 2018; NTA will create 3,000 practice centers for JEE Main examination which are functional on weekdays. The centers allow one hour to practice. National Testing Agency (NTA) has been established as a premier, specialist, autonomous and self-sustained testing organization to conduct entrance examinations for admission/fellowship in higher educational institutions. Click here to Know more. JEE Main syllabus provides the details about topics and chapters that may ask in JEE Main paper-1 and paper-2 examination. Both the papers are for different courses, therefore, the syllabus is also different for both. JEE Main syllabus for paper-1 contains important chapters from physics, Chemistry and Mathematics taught in the 11th and 12th standard of CBSE, ICSE, and other boards. For Paper-2 syllabus comprising of Mathematics, aptitude test, and drawing. Candidates can download the detailed syllabus as it will be released by NTA. Physics and measurement, Thermodynamics, Rotational motion, Laws of motion, Electronic devices, Oscillations and waves, Current electricity, Electromagnetic induction, and alternating currents, Optics, Electrostatics, Kinematics, Work, energy and power, Gravitation, Properties of solids and liquids, Kinetic theory of gases, etc. Part II: Understanding and appreciation of scale and proportion of objects, building forms and elements, color texture, harmony and contrast, Transformation of forms both 2 D and 3 D union, subtraction, rotation, Creating two dimensional and three-dimensional compositions using given shapes and forms, etc. To score well in the examination, students are advised to prepare PCM subjects thoroughly of class 11th and 12th standard. Time Management is very important. Set your timetable so that you can easily decide your study hours. Divide your time well among school, tuition, coaching classes, exercise, entertainment, etc. Important Topics for JEE Main. From 2019, NTA established a network of Practice Centres across all over India, Through these practice centers candidates will take the facility of practicing a lot of questions. In these practice centers, Experienced, Qualified, Nodal Officers available. They help students for clearing their doubts and motivate them, as let them inform how to perform and how to attempt online mode examination. NTA will create these test centers across India because they want to aware and want to give chance each and every student for preparing themselves for online mode examination. JEE Main 2019 cut-off will be announced after the completion of the exam. Meanwhile, students can check the previous years’ cut-off marks. It will be released via only online mode. It will be released in the month of February 2019. It will be available via only category-wise. After the few days of Examination Authority will release the JEE Main Answer Key in the official website. The answer key will be released in the month January 2019 along with OMR Sheet. Candidates can cross check their answers with the official answer key to know the expected marks. Those who are not satisfied with the answers key may challenge the answer key by paying Rs. 1000/- per question. The result of JEE Main (paper 1) has been declared on 31st January 2019 for January session and 30th April 2019 for April session via online mode. JEE Main 2019 result indicates actual scores and rank secured in the entrance examination. All India Rank (AIR) will also be published along with the result. JEE Main scorecard will not send to the students home via post or offline mode. The JAB authority prepared a rank link for all the students who appeared in the JEE Main. For Paper 1 and Paper 2 the rank list will be released separately. Through the help of rank list candidates will be allotted colleges for admission. If two candidates scored the same marks then the tie-breaking method will be applied for selection. Once JEE Main result will be declared by the conducting authority; then the Joint admission Boards released the counseling dates. Counseling schedule will be different for all India rank and state level counseling. The JEE Main Counselling process will be done in Online mode. Counseling process will be organized form the third week of June 2019. To appear in the counseling process; candidates need to register themselves first. JoSAA/CSAB are the authorities which conduct centralized counseling for admission to NITs/IITs/IIITs and CFTIs. The seat will be allotted on the basis of filled choices, rank, category and seat availability. Candidates need to download provisional seat allotment letter and need to pay seat acceptance fee. Once candidates pay the acceptance fee then candidates need to report in the allotted centers for verifying their documents. There is a huge number of colleges in every state that also offers admission through JEE Main. To get admission in these colleges, students have to apply separately in state counseling. Question: I got less than 60% marks in class 12th. Am I eligible for JEE Advanced 2019? Answer: No, Only Candidates who score 75% marks in class 12th or be in top 20% in their respective board eligible to appear JEE Advanced Examination. Question: I got a failure in 2018 and Again appearing in 2019 for qualifying examination. Am I eligible for JEE Main 2019? Answer: Yes, You are eligible. Question: Can I apply for JEE Main via offline mode? Answer: No, You can apply via only online mode. Question: What is the mode of JEE Main Examination? Question: Will JEE Main conducted twice in a year? Question: How many times, I can attempt JEE Main? Question: I have passed class 12th in 2016. Am I eligible for JEE Main 2019? Question: I am from JAC Board and got 58% in the qualifying exam and belong to SC Category. Am I eligible? Answer: Yes; You are eligible. Question: I am in Class 11th. Am I eligible to appear in JEE Main 2019? Answer: No your are not eligible. To eligible in JEE Main Examination you need to be passed out of appearing in the qualification examination. Question: Will JEE Advanced 2019 Cancelled? Question: What is cost of JEE Main Application Form? Answer: Check from the below given table: Papers Offline mode (Pen & Paper Based) Online mode (Computer Based) Appearing General/OBCs (Boys) SC/ST/PWD/All Girls General/OBCs (Boys) SC/ST/PWD/All Girls For Examination Centers opted in India Paper 1 or 2 1000 500 500 250 Paper 1 and 2 both 1800 900 1300 650 For Examination Centres opted in foreign. Question: I have only 60% marks in Class 12th. Am I Eligible for JEE Main 2019? Question: When will JEE Main Application Process Starts? Answer: For January session 1st September 2018 and For April session February 2019. Ques: While applying for Aadhar Card, I got Authentication Failed Message Occured, What I need to Do? Answer: Candidates need to verify the details while authenticating his aadhar details. The same process candidates need to follow while filling the JEE Main Application Form. Ques: If I belong from these three states J&K, Assam & Meghalaya. It is mandatory that i need to select exam centres in the same cities. Ques: My name is not correctly spelled in the Aadhar card? Ques: Is Aadhar Card is Necessary to apply for JEE Main 2019?Ques: Is Aadhar Card is Necessary to apply for JEE Main 2019? Ques: I belong from J&K. How Can I Apply for JEE Main 2019? Ques: I belong outside of the India (PIO/OCI/NRI). How can I Apply? Ques: All details mentioned correctly but the address is not spelled Properly? Ques: In my Aadhar Card; My Date of birth is not mentioned correctly? Ques: If I request for Aadhar Card updation but it will not updated till the starts of JEE Main Application Process. What I need to do? Question: Is fathers photographs necessary for filling JEE Main Application Form? Question: OBC Certificates needed to apply for JEE Main 2019? Question: I got admission in NITs, Can I re-apply for JEE Main 2019? Question: If I appear in January Session, than it will be counted my first attempt or two attempt? Question: Is it mandatory to appear in both examination? Answer: No it is not mandatory. Question: I have passed class 12th in 2018. How many times I can appear in JEE Advanced? Answer: Candidates can attempt JEE Advanced Examination twice with consecutive years. Question: I will be 16th on 9th August 2018. Am I eligible for JEE Main? Question: As 3 attempts will given to appear in JEE Main Examination, So Can I attempt it any time? Answer; Yes; You can attempt it any time but like that. If you are appearing class 12th in 2019 or will not want to give that year than you can use these attempt from next upcoming session. Question: Date of counselling for JEE Main January Session? Answer: In the month of June 2019. Question: I am physically disabled, Is any option available to appear via offline mode? Answer: No, It will be conducted via online mode only from 2019. Question: I am a NIOS students. Am I Eligible? Question: JEE Main exam will be conducted via offline or online mode? Answer:It will be conducted via only online mode. Question: If I qualify Physics and Maths Section in JEE Main, but not in Chemistry. Am I eligible for further process? Answer: No, Candidates who cleared all section will be eligible for next round. Question: Is it necessary to upload Domicile while filling JEE Main Application Form? Answer: No, There is not any option for uploading Domicile Certificate, You only need these certificates while counselling and while you going for admission (For Document Verification Purpose). Answer: Yes; You can apply. Hi could you please tell me about the best books which i need to go with? when willl jee main application form is available? From 1st of September for JEE main 1st . I have completed my 12th in 2016; Am I eligible for JEE Main 2019. No you are not eligible. What is the qualifying marks for the general category student? The best information you have provided. Can you please share previous year question papers PDF. I am from OBC category. Can you tell me the reservation criteria. How can i see mock test result? when will admit card release. When will release JEE Main Admit Card? I am studying in class 11th. Can I apply for JEE Main 2019 April Session? Is this the official website of JEE Main 2019? What is the minimum cut marks required to score to qualify in JEE Main Examination? Mujhe JEE Main ka Exam Mode Janna hai. By mistakenly My Son miss the JEE Main 2019 Registration, How can he apply for JEE Main 2019? I have only enrollment ID of Aadhar Card, can I apply for JEE Main 2019? What is the process for allocating Seats? How can we apply for JEE Main Counselling Process? I belong from the SC Category what is the minimum cut off marks to qualify in the JEE Main 2019? meri date of birth 17 january 1992 hai kya me apply kr skta hu JEE Main k liye? Me do bar apply kr chuka hu avi aur kitni bar apply kr skta hu? Photos ki specification kya hai? JEE Main Paper two ka syllabus chahiye mujhko? I am physically disabled, What is the minimum qualifying marks for JEE Main 2019? When will JEE Main Slot Booking Process Starts? What percentage of marks will be deducted, If I done a question with wrong? JEE Main is state level or national level engineering entrance? who is the conducting authority of JEE Main 2019? What courses under the JEE Main Examination? I want previous year JEE Main Question Papers? How many time candidates can attempt JEE Advanced Examination? What is the new changes introduced in the JEE Main Examination? Can I take fast food along with me in the examination hall? JEE Main Application Form is available via online mode or offline mode? Is class 12th roll number is necessary to apply for JEE Main 2019? I belong from the OBC category how much marks do I need to score for qualifying the JEE Main Examination? How much relaxation provided to the SC/ST candidates? If I got selection in JEE Main January session, Still Do I need to appear in JEE Main Examination or not? I have completed my 12th in 2017, can I still apply for JEE Main 2019, If I attempt two times earlier? I have done again mistakes in my JEE Main Application Form How can I correct it? For JEE Advanced, 75% marks are required to score in only PCM Subjects or in all the subjects? 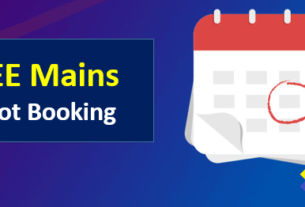 Is JEE Main Slot Booking Process still available? My friends belong to PwD category how can he claim reservations criteria? What is the selection process to get admission in IITs? I am from Assam, What is the eligibility criteria for us? What new changes introduced in the JEE Main Examination? What is the syllabus for JEE Main Mathematics Subjects? I want the best books for JEE Main Physics Preparation? How much weightage goes to the organic chemistry section? I applied for improvement in mathematics subjects but I have 65% marks in 12th examination. Can I eligible for JEE Main 2019? I am a girl, Is there any application fee for JEE Main 2019? Me do bar already apply kr chuka hu kya me tisri bar v apply kr skta hu? I am pursuing my 12th from a board where I have only 4 subjects, Can I apply for JEE Main 2019? Mujhe best books chahiye Calculus k liye? JEE Main Maths section kitna difficult hai? What is the procedure to download JEE Main Admit Card? I am a Diabetic Patient. Can I take foods in the examination hall? Will the authority will send the admit card via post? What is the process for paying offline mode application fee? I heard somewhere that JEE Main Paper 1 is available via offline mode? I am pursuing my diploma, Can I apply for JEE Main 2019? My Hometown is Nepal but Studying 12th class from Inia. Can I apply for JEE Main 2019? Mujhe JEE Advance k liye best books chchaiye? How Many Marks do I need to score in JEE Main 2019, Through I can get admission in Indian Institute of Technology? JEE Main Ke admit card kab release honge. When willRelease JEE Main Admit Card? I am preparing for JEE Main January session, Please provide me last 10 year question papers? Please provide me the tips given by the toppers? When will release JEE Main Admit Card for 2019 Session?